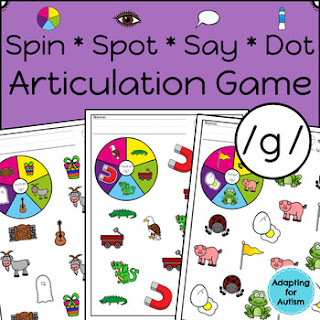 This free resource includes 4 no prep speech therapy games for a unique way to practice articulation goals for the sound /g/. Students have fun spinning and searching for the pictures while practicing their sound in the initial, medial and final positions. Perfect for warm-ups, icebreakers, homework, group lessons, last minute planning and carryover. This game is part of my Articulation Spinner Games BUNDLE which includes 18 additional games. Grab all sounds and save 20%! • /g/ - try it free!